The term re-engraved is really a misnomer. Coins are struck from dies, not engraved. The term really refers to something that is done to a coin after it has left the Mint. The most notorious of the re-engraved coins is a Lincoln cent with a tiny head of John F. Kennedy facing Lincoln. 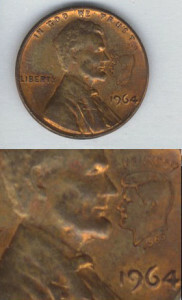 This particular alteration accompanied a card comparing the life of Lincoln and Kennedy. Both were assassinated by Southerner. Both assassins were known by their three names. Both names comprise fifteen letters. Booth ran from the theater and was caught in a warehouse. Oswald ran from a warehouse and was caught in a theater. 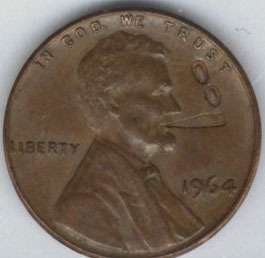 Just for Fun, here’s another re-engraved cent showing Lincoln smoking a cigar.